What are the three best Sequim MLS sites you can use to search online to find your home or land? Today I’ll share what they are and tell you exactly why these are the three best Sequim MLS sites. Our number one pick for the best Sequim MLS site is Sequim4Sale.com, also known as Sequim-Homes.com. Unlike many MLS sites that are created and maintained by a corporation far away from Sequim, or other MLS sites that are awkward to use and not very friendly, this Sequim MLS site was designed and programmed specifically for Sequim buyers. It is easy to navigate, powerful in its search capacity, and you can save favorites and set up email alerts. 100% of all the Olympic Listing Service (OLS) listings are on this site. All local agents use the OLS, so this is where you will find all the local listings. 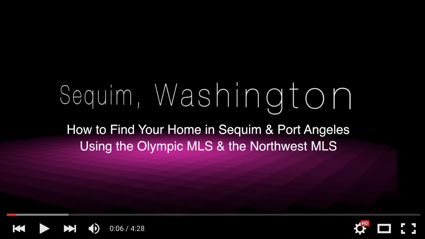 There’s an introductory video, and a series of videos to help you get the most out of this Sequim MLS site. There is also a 24/7 technician standing by to help you if you have any questions. This is by far the best Sequim MLS site. Period. Our second pick for the best Sequim MLS site is LuxuryWaterViewHomes.com. This site includes all the Northwest MLS listings for homes and land in the Sequim area as well as most of the state of Washington, including the entire Seattle-Tacoma metropolis. Only 55% of the Sequim brokers are members of the Northwest MLS, so roughly half of the Sequim listings are in this system. But this site allows you to search a much larger area for other listings. The last but very powerful of our Best Sequim MLS sites is SequimForSale.com (as opposed to Sequim4Sale.com). This site includes all listings from both the Olympic Listing Service and the Northwest MLS, which makes it a very powerful site. Even Seattle area Realtors use this site to look at Sequim listings. Use one or all three of these Sequim MLS sites, but if you are looking only at Sequim listings, we recommend our first choice at Sequim4Sale.com. When you look at MLS sites (multiple listing service sites) to search for your home, you probably assume that the information you are looking at is accurate. Think again. Buyers call and email me several times a week asking about information they find on a national MLS site that turns out to be slightly wrong or totally wrong. If you are comparing properties and narrowing your list of homes to look at, wrong information could certainly eliminate homes you would actually like, and could keep homes you would filter out on the list. And one of the biggest frustrations for buyers is large variations in values listed for properties on various national MLS sites. This article will help you objectively get this right. National MLS sites include sites like Zillow.com, Trulia.com, Homes.com, Realtor.com, HomeFinder.com, BackPage.com, Oodle.com, HomeGain.com, Google.com, RealtyStore.com, Homes.Yahoo.com, Kijiji.com (ebay), eLookyloo.com, and hundreds of other real estate sites where listings can be syndicated. Here’s what the public and buyers like you may not know about national MLS sites. They are not always accurate, and sometimes the information is terribly incorrect. Sometimes the prices are wrong, the estimates of value are wrong, the specific information is wrong, and sometimes the home is not actually for sale although it is showing as “For Sale” on a national MLS site. How can that happen? Once I tell you, you will totally get it. Listings originate with a local listing broker. The broker inputs the listing data and photos into the local MLS. Some MLSs syndicate listings to dozens and sometimes hundreds of other real estate sites. While that sounds simple enough, technically it is very complicated. Local MLSs around the U.S. have different software, different data fields, and use different formatted photo sizes. MLSs use what is called an IDX data feed to syndicate, but not all MLS IDX data feeds include the same data fields or the same names of data fields. Some resize photos in different ways, too, which can result in distortion. On the receiving end of the MLS data, these national MLS sites all have different software also and different data fields. These syndications are all done with software, and no humans are involved. So you have the merging of data from one system to many other national MLS sites that may not match up, and often do not. So you can lose important data, like the property taxes, the actual tax assessed value, the square footage, the acreage, the number of rooms in a house, or the number of bedrooms or bathrooms, whether there is a guest house or not, whether the garage is attached or separate, and so on. Some of these national MLS sites are pretty and they sure look good, but that doesn’t mean your information is all good. I have a client whose listing shows up twice on Zillow with different values and different information. We can’t get rid of the second one either. On top of all this, many national MLS sites are illegally “scraping” data off the internet without permission from the sources. This information is then sold to other companies who do not know it is illegally obtained. Then the data is propagated again on other sites, and errors can be repeated ad infinitum. Now that you know national MLS sites are not necessarily reliable, would you like to use a Sequim MLS site that is 100% accurate and includes 100% of the local listings? This data comes directly from the local listing agents, and it is reliable. 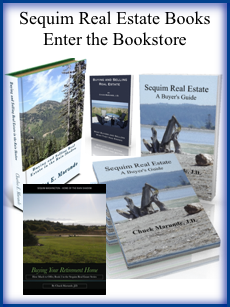 You’ll find this site easy to use, and it’s pretty too: Sequim Real Estate. I think you’ll be glad you used this local Sequim MLS site, not one of the national MLS sites. Sequim MLS listings show up on all the public MLS sites as “active listings” even when they are sold and their status is pending. This is confusing to most buyers who assume that if it is an active listing, it is still available. Clients often asked me when they find out the home they want to view is pending and unavailable, why it is still showing up on all the MLS sites online as still for sale? What is the best Sequim MLS site? Some use Trulia or Zillow, but there is a much more accurate Sequim MLS site for buyers. Some clients have told me that they use Zillow to find home values in Sequim, and some search Trulia for listings in the Sequim MLS. Here’s what they don’t know. The Zillow and Trulia databases are incomplete and often inaccurate in Sequim and Port Angeles. Let me explain. Both these sites are adding to their database, but they prioritized major metropolitan areas first, and they’ve been working on building complete databases on millions and millions of homes in the major urban areas. Sequim is off that beaten path. Way off. Is the Northwest MLS in Sequim and Port Angeles and Is It Important? Is the Northwest MLS in Sequim and Port Angeles? Yes and no. Sequim and Port Angeles in Clallam County have two multiple listing services (MLS’s). It’s unfortunate, because there are a number of negative implications to having two competing MLS’s. Having two MLS’s creates confusion for buyers, and they may miss a home that is in one MLS and not the other. It also creates confusion for sellers, because many sellers don’t understand the importance of being listed in both MLS’s at this time. The last negative implication of two MLS’s is that some brokers who choose to be a member of both, have to pay twice as much in fees and must enter listings twice as many times and maintain listings twice as many times. Buyers who want to search Sequim real estate listings online have many options. 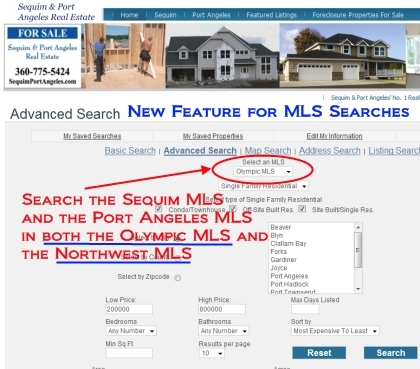 Years ago I wanted my clients to have a powerful Sequim real estate listings search tool that was easy to navigate, so I had my programmers create one according to my specifications and connect it to both the Olympic Listing Service and the Northwest MLS databases. Compare the result to the other franchise template MLS sites, and you can see why clients love this site. But I wanted more for my clients. I instructed my programmers to make this site absolutely free and with no requirement to register if people just wanted to search for properties. I wanted them to be able to search 100% of all the listings in both the OLS and the NWMLS. 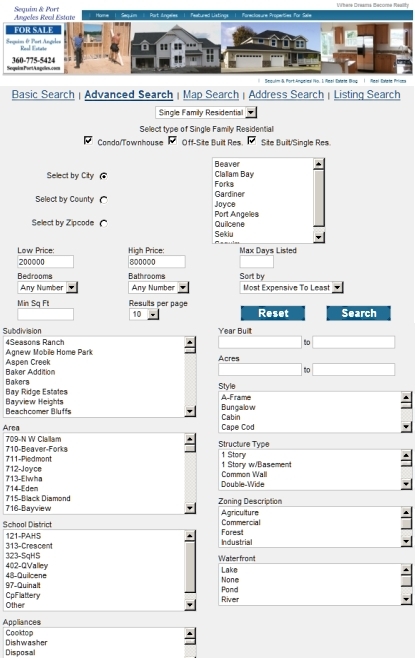 I also asked my programmers to make this MLS search site easy for clients to be able to save their property searches so they can filter through many listings and keep an organized list of the properties they may want to see when they come to Sequim. And lastly, I wanted clients to be able to have new Sequim real estate listings emailed to them based on their search parameters, and I wanted them to be able to edit and change their searches. In other words, I wanted my clients to be in total control of their property searches. Click on the image above to go directly to Sequim real estate listings. 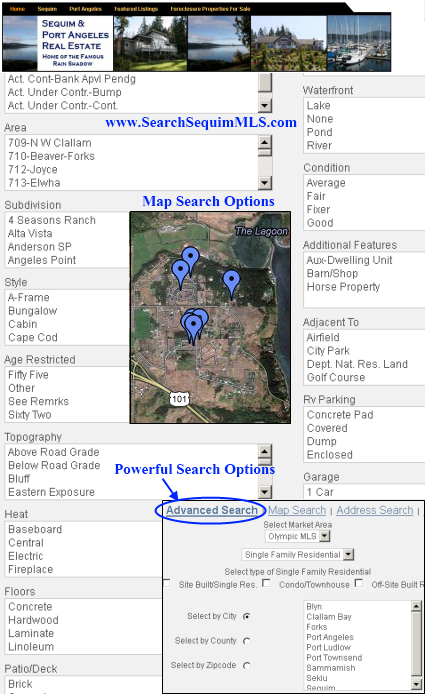 Notice that in the “Advanced Search” you can include very specific search parameters, including waterfront property, mountain view property, and a detailed list of options. I’m always working to improve the tools and services I give my clients. Having just checked out all the other local MLS search sites, I can tell you this one is the most powerful and the easiest to navigate. I hope you find this Sequim real estate listings site useful in your search. 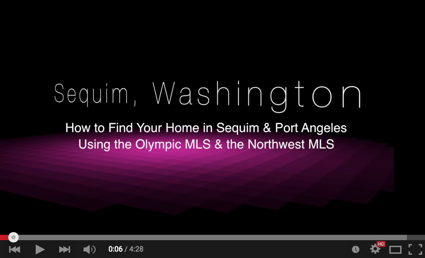 Sequim MLS on your iPod – Now you can search the Sequim MLS on your iPod. For all you passionate iPod Phone and iPod Touch fans in the virtual iPod world, you can now search the entire Sequim MLS and Port Angeles MLS with your iPod. Here’s how easy it is. From your iPod go to Apps and search for “IDX” without the quotes. Download the app called “myAgent by IDX” (by IDX, Inc.). When you load it you will be asked for a Sequim code. The code is “3523” and once you type it in you won’t ever have to type it in again. Load the app, type in the Sequim code of 3523, and you are looking at a nice map showing all the Sequim MLS listings and the Port Angeles MLS listings. You simply drag the map across the screen to move around to the neighborhood you want. To narrow your search for the perfect home, simply click on “Filter” at the bottom right, and you can select a price range, number of bedrooms, bathrooms, and square footage. Once you pull up a screen with some listings represented as little red houses, you can touch a house and it opens up with the price and address. Touch the little blue arrow, and you get the full listing with all the photos and details. Come on, admit it: This is so cool! 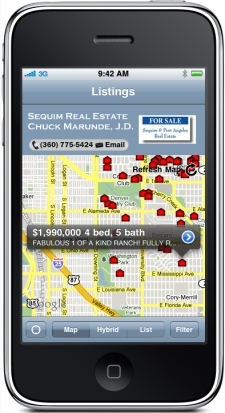 Search the Sequim MLS on your iPod, another powerful and absolutely free service courtesy of Chuck Marunde, your favorite Sequim Buyer’s Agent. Water view lots in Sequim and Port Angeles are plentiful. Since we are on the Olympic Peninsula, we are, of course, surrounded by water. We have views of the John Wayne Marina, the Strait of Juan de Fuca, and the International waters looking toward beautiful Victoria, British Columbia, Canada. To our immediate south we have the stunning backdrop of the Olympic Mountains. So does that mean you can easily find a gorgeous lot to build your retirement home and have a stunning water view? First, it’s not easy to find the ideal lot for your home. There are many lots, but some of them require a four wheel drive to reach, and that simply is not for everyone. Second, price is a factor. The greater the water view, the greater the price. That probably doesn’t surprise you. Here’s what a recent client of mine from California learned as he scoured the Internet prior to arriving and as he and I walked lots. There are many lots with great water views, but few that were ideal for him and his wife. The first lots we looked at were high in elevation, so they did have great views, but the roads to them and the driveways to the building sites were extremely steep, far too steep for his wife who might drive to the grocery store herself on one of those rare days when we have lots of snow. The next lots we looked at are in a well known development with great water views, but the lots are small, the prices big, and many of the lots had tons of fill, which means the excavation costs and additional concrete support will substantially increase the cost of building a home. We did find two lots adacent to each other that were within the ball park on price, under $100,000, but the water view is very slim. These lots also had a valley and mountain view, so they are great lots, but the water view is minimal. Stepping up to $200,000, we suddenly open up another level of water views, substantially better in fact. But this raises the price of lot and building by a hundred thousand dollars, not something everyone will be able or willing to do. On the lowest end of lot prices, we do find lots under $60,000, but these are small lots without water views, and often with other less favorable features, such as a less attractive location or close to Highway 101 and the traffic noise. The challenge if you are doing a search on the Internet from out of state is that many agents don’t provide lots of excellent photos of lots, and even if you do have photos of a water view, photos can’t possibly do justice to the view, so you can’t really see what it would really be like. Where can I find the best Sequim MLS search site? I believe the best Sequim MLS and Port Angeles MLS site where you can search all the local real estate listings is one I had programmed specifically with buyers in mind. The reason this unique is because you can search the entire Olympic Listing Service and the entire Northwest Multiple Listing Service easily from this page. If you didn’t know, we have two MLS’s here in Clallam County, so our listings are bifurcated. Well, theoretically 100% of our listings are in the OLS, and from my statistical analysis, about 67% of the listings are also in the NWMLS. The reason this is so important to buyers is that they could be searching an aent’s website that only pulls in listings from the NWMLS, which means you will be looking at all of their listings but not all of the listings available here. If you have been reading my articles, you’ll already know that I am very consumer-centric, and I don’t like consumers not getting what they expect to get. Some agents might prefer you only see their own listings, so they can double up on the commission. That’s not the way consumers (buyers) ought to be treated. I’m a member of both systems, so I had my programmer set this page up so you could search both MLS’s here. Notice the pull down menu near the top of the search section in the middle. You can select either Olympic MLS or Nowthwest MLS. Working hard night and day to provide buyers like you with the tools you need to do powerful searches on the Internet without me or anyone else getting in your face. If you have any questions, you know how to reach me: chuckmarunde@gmail.com or 360-775-5424. 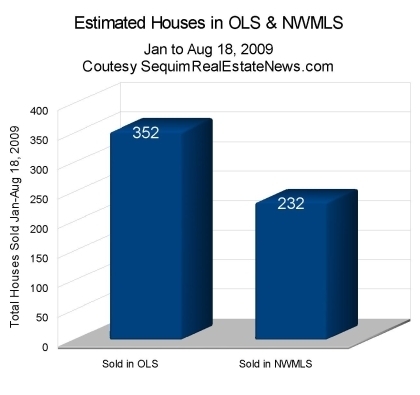 Sequim MLS: Olympic Listing Service or NWMLS? How about that Sequim MLS? Sequim and Port Angeles are currently stuck with two multiple listing services (MLS). 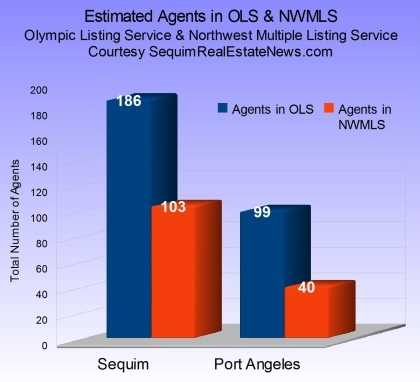 The Olympic Listing Service (OLS) has 100% of all local MLS listings in it, which is to say that all Sequim and Port Angeles agents are members of the OLS. The second MLS is the Northwest Multiple Listing Service (NWMLS), and it has been the primary MLS for King and Pierce Counties and many other counties for years. As shown in the graph, a smaller percentage of local agents are also members of the NWMLS. 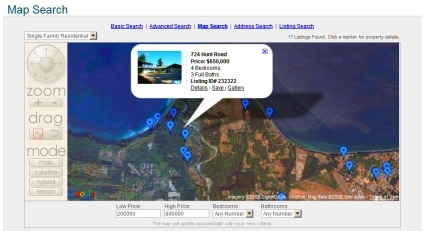 When buyers are searching the Sequim MLS or the OLS, which system do they use? That depends on the site they are using to search the MLS. If they are using a site with the NWMLS IDX data feed, they are not seeing all of the listings for sale here. If they are using a site with the OLS IDX data feed, they are seeing 100% of the listings. But buyers may not know this as they are doing their search. Online MLS searches that rely upon the NWMLS always have this logo by each listing. I am a member of both services, although not long ago I felt that being a member of the NWMLS made no sense. Why be a member of a second MLS, pay additional monthly dues (not to mention a $500 sign-up fee for a broker), and have to input all my listings twice, when only the OLS has all of the listings in it? When I do a comparable market analysis (CMA) to arrive at fair market value, it must be done only in the OLS, because it would be incomplete in the NWMLS. Market reports using only the NWMLS would be incomplete for this market. I finally decided to be a member of both so I could give my clients the greatest possible exposure for their listings, and so I could reach as many possible buyers on the Internet as I could. In addition, it seems clear to me that the future of the Sequim MLS is the NWMLS. I will be glad when we are all on one MLS system. As a practical matter, even though the NWMLS does not include all the local listings, the NWMLS is far superior to the OLS as software and much more powerful. It has much greater usefulness to agents and much more back office support, including a full time attorney. For clients who want to search 100% of the listings available, I suggest using my Sequim MLS search (it is also the Port Angeles MLS), which does include 100% of all available homes for sale listed by all agents in Sequim and Port Angeles. Search the entire Sequim MLS and Port Angeles MLS. Search the Sequim MLS and the Port Angeles MLS directly from this real estate blog. Search the entire Sequim MLS or Port Angeles MLS. No money has been spared to give you the most advanced cutting edge MLS search tool, so you can search all the homes for sale in the entire MLS in Sequim and Port Angeles. You can also search for vacant land. You can narrow your focus by city, or even areas within and around Sequim and Port Angeles, and you can get as specific as you want with your parameters (bedrooms, square footage, etc.). Once you get a list of results, just view the details for a full listing sheet with photos, too. And I also added a map feature, so you can see where each property is located. Just click on the image below to start your search now. Notice that I have not required that you register your name and email. Of course, if you find this useful, I would love the privilege of being your buyer’s agent. 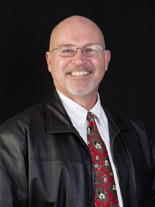 Sequim real estate and Port Angeles real estate found here. This is a great feature, because you can instantly see on the map where the listings are located, and you simply click on any that catch your interest, and the page opens to more photos and detailed information. 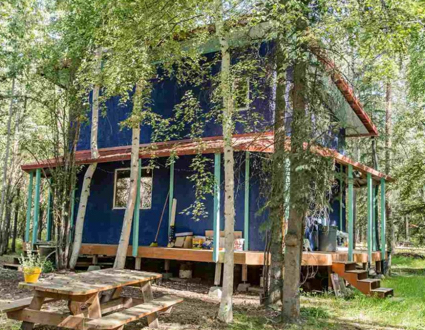 Of course, you can also search by MLS# or by price and the number of bedrooms and bathrooms, acreage and so on. Courtesy of Chuck Marunde and Sequim & Port Angeles Real Estate, LLC. 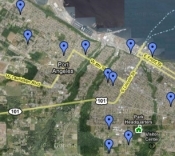 Now you can search the Sequim and Port Angeles MLS of over 1,500 listings with a Map Search feature. Of course, you can also search with your unique parameters at the same time and see the property details by simply clicking on the listing indicators on the map. Try it, you’ll like it. 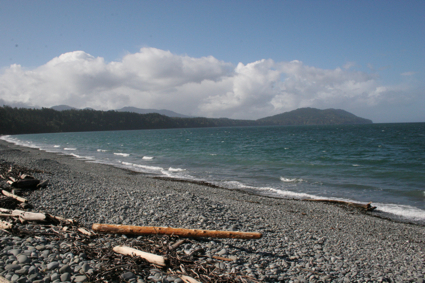 Click on this image to search the Sequim and Port Angeles MLS Listings. 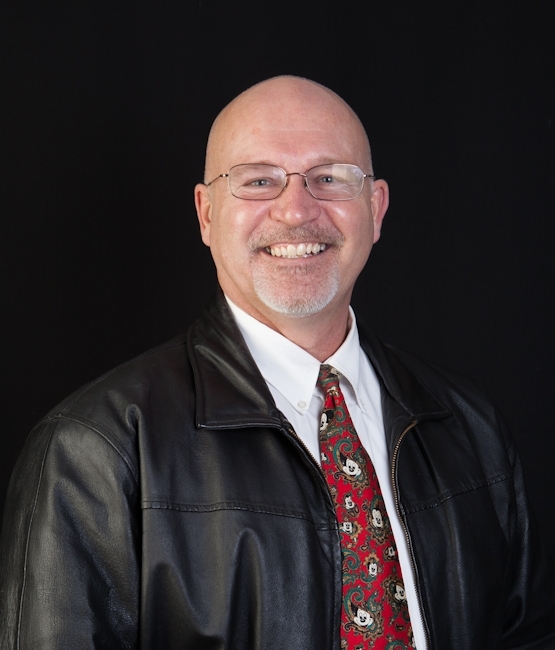 I am constantly upgrading and developing new systems that make it easy for you, the buyer, to find exactly what you are looking for, and at no cost, no obligation, and no required registration. All free, courtesy of Chuck Marunde and Sequim & Port Angeles Real Estate, LLC. The Sequim MLS and Port Angeles MLS consists of the Olympic Listing Service (OLS) and for some the Northwest Multiple Listing Service (NWMLS). All local brokers and agents are members of the OLS, but not all are members of the NWMLS. I’ve been meditating on this issue in light of the great conflict that stirs quietly behind the scenes among brokers. Mediation is a good thing. It reduces stress and sometimes gives us answers that seem to drop down out of the heavens. While I was meditating on the relative merits of these two competing listing services, I had a revelation, and suddenly something hit me on the head pretty good. I thought God’s messenger had miraculously tapped me with wisdom. When I got up, I realized it was just the book on my computer monitor that fell. Fortunately, my head cushioned its fall. Unfortunately, my revelation probably found its roots in terra firma rather than the heavens. By now, you’re probably thinking, “So, what is the revelation?” Perhaps it’s more of a reflection, rather than a revelation. Okay, here it is. Since us local agents are all members of the OLS but not all members of the NWMLS, that makes the NWMLS pretty much useless. Let me explain. When an agent does a search of the listing database of all homes and land for sale in Sequim and Port Angeles, he needs a complete database. If the database is incomplete, he cannot expect to pull together a decent set of comps to determine price or make accurate comparisons. Since not all local brokers are members of the NWMLS, that database is incomplete, and any data used to arrive at price comparisons will also be less than complete. Some brokers or agents like to make the argument that having a listing in both systems gets exposure to Seattle side agents and buyers, but no agent I know in Sequim or Port Angeles has been able to tell me that they have sold a listed property that way. Local agents use the OLS, not the NWMLS to search for local properties and to email clients reports. I have used both listing services, and there’s no question at all which is better–it is the NWMLS. The NWMLS has much better technology, and it has much better content with the statewide forms. Unfortunately, because many brokers refuse to be part of the NWMLS but all are members of the OLS, that means only the OLS is a complete database. Why don’t all agents and brokers simply agree to be part of the NWMLS? First, we are not, in fact, picking up any buyers through the NWMLS. That alone ought to be enough. Some of my clients will logically say, “Well, don’t we get more exposure?” Reasonable question, but I never got any calls from Seattle area Realtors during the entire year I was a member of both services here, nor has any Realtor in Clallam County ever sold one of their listings through the NWMLS that I know of, and I have talked with many many agents on this issue. Sure, someone somewhere is going to come up with an exception from years past. But we don’t deal with would of, could of, or maybe. We are trying to sell real estate now to real buyers. Second, where are our buyers coming from? Mostly from out of state, and I also track Seattle area people hitting my website. Guess what the Seattle buyers are doing (and I just wrote an offer for a Seattle area buyer on a $419,000 house)? They are jumping up on the Internet and going to the search engines. They don’t go to a Seattle area Realtor’s website to log into NWMLS. They are finding my sites directly through the search engines. That’s what people do now. They use search engines. They type in phrases like, “Port Angeles real estate water view” or a similar phrase. When they type that in a search engine, they get real results right here in River City. If they type such a search in the NWMLS, they don’t get much, because the majority of local listings are not there, but they are NOT going to the NWMLS to do this search. They, like everyone else, are using search engines, like Google. Third, most people don’t realize the NWMLS cost about $960 for me as a broker to sign up, and about $360 per year for me and every one of my agents. If a broker is a member, it is mandatory that all agents be members. Since leads don’t come in from the NWMLS (honestly they do NOT), that would be like throwing money off the bridge. Fourth, the OLS and the NWMLS are only two databases available on the Internet, and there are about three dozen that people use. Most all of these real estate databases are pulling information from sources other than the NWMLS. These other database services or Internet services are optimized for the search engines. The NWMLS and the OLS are not optimized for search engines. Until all local brokers agree to be members of the NWMLS, there is not a compelling reason to do so. Why do you think the largest local brokerage, Coldwell Banker Uptown Realty, is not a member? You can search over 1,500 Sequim MLS listings and Port Angeles MLS Listings from my website at: Search MLS Listings. There’s a short audio on how to use the MLS search to find what you are looking for. If you are unable to find exactly what you are looking for, do not assume it doesn’t exist, as the audio explains. The local MLS input data sheet has many check boxes, and not all agents complete all the “include” or “exclude” sections. It’s easier for agents to use the “comments” or “remarks” section to describe something unique or special about the property. Sometimes people run into trouble when they try to listen to an audio on their Internet browser, whether it is Internet Explorer or Mozilla Firefox. The solution is to check the options in your browser, and make sure that the default setting for listening to “.mp3’s” is the audio program you use on your computer (i.e. Windows Media Player, Winamp, etc.). If you have any difficulty or can’t find the home or land you are looking for, email me at chuckmarunde@gmail.com or simply call me at 360-775-5424. P.S. I will be glad to help you with any technology problems you’re having on this. Come on now, when was the last time a Realtor offered help with your tech issues?